For other uses, see Harp (disambiguation). 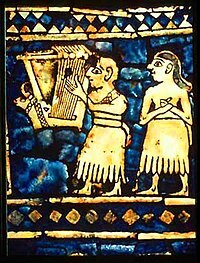 The earliest harps and lyres were found in Sumer, 3500 BC, and several harps were found in burial pits and royal tombs in Ur. 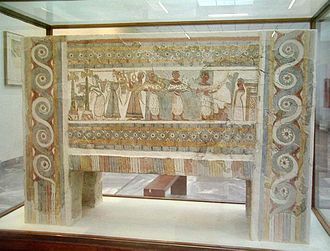 The oldest depictions of harps without a forepillar can be seen adjacent to the Near East, in the wall paintings of ancient Egyptian tombs in the Nile Valley, which date from as early as 3000 BC. These murals show an instrument that closely resembles the hunter's bow, without the pillar that we find in modern harps. The chang flourished in Persia in many forms from its introduction, about 4000 BC, until the 17th century. Around 1900 BC arched harps in the Iraq–Iran region were replaced by angular harps with vertical or horizontal sound boxes. By the start of the Common Era, "robust, vertical, angular harps", which had become predominant in the Hellenistic world, were cherished in the Sasanian court. In the last century of the Sasanian period, angular harps were redesigned to make them as light as possible ("light, vertical, angular harps"); while they became more elegant, they lost their structural rigidity. At the height of the Persian tradition of illustrated book production (AD 1300–1600), such light harps were still frequently depicted, although their use as musical instruments was reaching its end. The works of the Tamil Sangam literature describe the harp and its variants, as early as 200 BC. Variants were described ranging from 14 to 17 strings, and the instrument used by wandering minstrels for accompaniment. Iconographic evidence in of the yaal appears in temple statues dated as early as 500 BC One of the Sangam works, the Kallaadam recounts how the first yaaḻ harp was inspired by an archer's bow, when he heard the musical sound of its twang. Another early South Asian harp was the ancient veena; unlike the modern instrument of the same name, the ancient veena was a harp vice the modern lute-type instrument. Some Samudragupta gold coins show of the mid-4th century AD show (presumably) the king Samudragupta himself playing the instrument. The ancient veena survives today in Burma, in the form of the saung harp still played there. The harp was popular in ancient China and neighboring regions, though harps are largely extinct in East Asia in the modern day. The Chinese konghou harp is documented as early as the Spring and Autumn period (770–476 BC), and became extinct during the Ming Dynasty (AD 1368–1644). A similar harp, the gonghu was played in ancient Korea, documented as early as the Goguryeo period (37 BC – AD 686). Harps are essentially triangular and made primarily of wood. Strings are made of gut or wire, often replaced in the modern day by nylon, or metal. The top end of each string is secured on the crossbar or neck, where each will have a tuning peg or similar device to adjust the pitch. 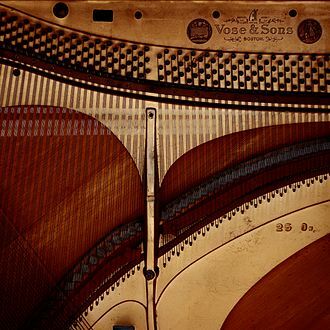 From the crossbar, the string runs down to the sounding board on the resonating body, where it is secured with a knot; on modern harps the string's hole is protected with an eyelet to limit wear on the wood. It is the distance between the tuning peg and the soundboard, as well as tension and weight of the string, which decide the pitch of the string. The body is hollow, and when a taut string is plucked, the body resonates, projecting sound. The longest side of the harp is called the column or pillar, though some earlier harps, such as a "bow harp", lack a pillar. On most harps the sole purpose of the pillar is to hold up the neck against the great strain of the strings. On harps which have pedals (largely the modern concert harp), the pillar is a hollow column and encloses the rods which adjust the pitches, which are levered by pressing pedals at the base of the instrument. On harps of earlier design, a given string can play only a single note without retuning. In many cases this means such a harp can only play in one key at a time and must be manually retuned to play in another key. Various remedies to this limitation evolved: the addition of extra strings to cover chromatic notes (sometimes in separate or angled rows distinct from the main row of strings), addition of small levers on the crossbar which when actuated raise the pitch of a string by a set interval (usually a semitone), or use of pedals at the base of the instrument which change the pitch of a string when pressed with the foot. These solutions increase the versatility of a harp at the cost of adding complexity, weight, and expense. While the angle and bow harps held popularity elsewhere, European harps favored the "pillar", a third structural member to support the far ends of the arch and soundbox. 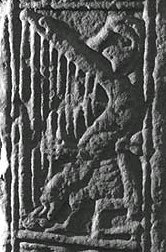 A harp with a triangular three-part frame is depicted on 8th-century Pictish stones in Scotland and in manuscripts (e.g. the Utrecht Psalter) from early 9th-century France. The curve of the harp's neck is a result of the proportional shortening of the basic triangular form to keep the strings equidistant; if the strings were proportionately distant they would be farther apart. As European harps evolved to play more complex music, a key consideration was some way to facilitate the quick changing of a string's pitch to be able to play more chromatic notes. By the Baroque period in Italy and Spain, more strings were added to allow for chromatic notes in more complex harps. In Germany in the second half of the 17th century, diatonic single-row harps were fitted with manually turned hooks which fretted individual strings to raise their pitch by a half step. In the 18th century, a link mechanism was developed connecting these hooks with pedals, leading to the invention of the single-action pedal harp. The first primitive form of pedal harps was developed in the Tyrol region of Austria. Jacob Hochbrucker was the next to design an improved pedal mechanism around 1720, followed in succession by Krumpholtz, Nadermann, and the Erard company, who came up with the double mechanism, in which a second row of hooks was installed along the neck, capable of raising the pitch of a string by either one or two half steps. While one course of European harps led to greater complexity, resulting largely in the modern pedal harp, other harping traditions maintained simpler diatonic instruments which survived and evolved into modern traditions. In the Americas, harps are widely but sparsely distributed, except in certain regions where the harp traditions are very strong. Such important centres include Mexico, the Andean region, Venezuela, and Paraguay. They are derived from the Baroque harps that were brought from Spain during the colonial period. Detailed features vary from place to place. The Paraguayan harp is that country's national instrument, and has gained a worldwide reputation, with international influences alongside folk traditions. Paraguayan harps have around 36 strings, played with the fingernails, and with a narrowing spacing and lower tension than modern Western harps, and have a wide and deep soundbox which tapers to the top. The harp is also found in Argentina, though in Uruguay it was largely displaced in religious music by the organ by the end of the 18th century. The harp is historically found in Brazil, but mostly in the south of the country. Mexican "jarocha" harp music of Veracruz has also gained some international recognition, evident in the popularity of "la bamba". [original research?] In southern Mexico (Chiapas), there is a very different indigenous style of harp music. In Venezuela, there are two distinct traditions, the arpa llanera and the arpa central (or arpa mirandina). The modern Venezuelan arpa llanera has 32 strings of nylon (originally, gut). The arpa central is strung with wire in the higher register. A Mangbetu man playing a bow harp. A number of types of harps are found in Africa, predominantly not of the three-sided frame-harp type found in Europe. A number of these, referred to generically as African harps, are bow or angle harps, which lack forepillars joining the neck to the body. A number of harp-like instruments in Africa are not easily classified with European categories. Instruments like the West African kora and Mauritanian ardin are sometimes labeled as "spike harp", "bridge harp", or harp lute since their construction includes a bridge which holds the strings laterally, vice vertically entering the soundboard. While lyres and zithers have persisted in the Middle East, most of the true harps of the region have become extinct, though some are undergoing initial revivals. The Turkish çeng was a nine-string harp in the Ottoman Empire which became extinct at the end of the 17th century, but has undergone some revival and evolution since the late 20th century. A similar harp, the changi survives in the Svaneti region of Georgia. In the remote and mountainous Nuristan province of Afghanistan the Kafir harp has been part of the musical traditional for many years. In India, the bin-baia harp survives about the Padhar people of Madhya Pradesh. The harp largely became extinct in East Asia by the 17th century; around the year 1000 harps like the vajra began to replace preceding[clarification needed] harps. A few examples survived to the modern era, particularly Myanmar's saung-gauk, which is considered the national instrument in that country. Though the ancient Chinese konghou has not been directly resurrected, the name has been revived and applied to a modern newly invented instrument based on the Western classical harp, but with the strings doubled back to form two notes per string, allowing advanced techniques such as note-bending. The concert harp is a technologically advanced instrument, particularly distinguished by its use of "pedals", foot-controlled devices which can alter the pitch of given strings, making it fully chromatic and thus able to play a wide body of classical repertoire. The pedal harp contains seven pedals that each affect the tuning of all strings of one pitch-class. The pedals, from left to right, are D, C, B on the left side and E, F, G, A on the right. Pedals were first introduced in 1697 by Jakob Hochbrucker of Bavaria. In 1811 these were upgraded to the "double action" pedal system patented by Sébastien Erard. The addition of pedals broadened the harp's abilities, allowing its gradual entry into the classical orchestra, largely beginning in the 19th century. The harp played little or no role in early classical music (being used only a handful of times by major composers such as Mozart and Beethoven), and its usage by Cesar Franck in his Symphony in D minor (1888) was described as "revolutionary" despite some body of prior classical usage. Entering the 20th century, the pedal harp found use outside of classical music, entering jazz with Casper Reardon,[when?] the Beatles 1967 single "She's Leaving Home", and several works by Björk which featured harpist Zeena Parkins. New Salem Village re-enactor playing a Celtic harp. In the modern era, there is a family of mid-size harps, generally with nylon strings, and optionally with partial or full levers but without pedals. They range from two to six octaves, and are plucked with the fingers using a similar technique to the pedal harp. Though these harps evoke ties to historical European harps, their specifics are modern, and they are frequently referred to broadly as "Celtic harps" due to their region of revival and popular association, or more generically as "folk harps" due to their use in non-classical music, or as "lever harps" to contrast their modifying mechanism with the larger pedal harp. The modern Celtic harp began to appear in the early 19th century in Ireland, contemporary with the dying-out of earlier forms of Gaelic harp. Dublin pedal harp maker John Egan developed a new type of harp which had gut strings and semitone mechanisms like an orchestral pedal harp; it was small and curved like the historical cláirseach or Irish harp, but its strings were of gut and the soundbox was much lighter. In the 1890s a similar new harp was also developed in Scotland as part of a Gaelic cultural revival. In the mid-20th century Jord Cochevelou developed a variant of the modern Celtic harp which he referred to as the "Breton Celtic harp"; his son Alan Stivell was to become the most influential Breton harper, and a strong influence in the broader world of the Celtic harp. A multi-course harp is a harp with more than one row of strings, as opposed to the more common "single course" harp. On a double-harp, the two rows generally run parallel to each other, one on either side of the neck, and are usually both diatonic (sometimes with levers) with identical notes. The triple harp originated in Italy in the 16th century, and arrived in Wales in the late 17th century where it established itself in the local tradition as the Welsh harp (telyn deires, "three-row harp"). The triple consists of two outer rows of identical diatonic strings with a third set of chromatic strings between them. These strings are off set to permit the harpist to reach past the outer row and pluck an inner string if a chromatic note is needed. Some harps, rather than using pedal or lever devices, achieve chromaticity by simply adding additional strings to cover the notes outside their diatonic home scale. 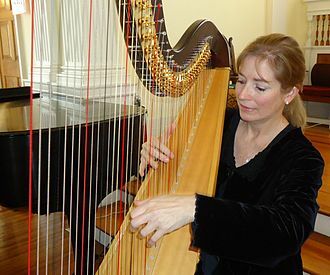 The Welsh triple harp is one such instrument, and two other instruments employing this technique are the cross-strung harp and the inline chromatic harp. The cross-strung harp has one row of diatonic strings, and a separate row of chromatic notes, angled in an "X" shape so that the row which can be played by the right hand at the top may be played by the left hand at the bottom, and vice versa. This variant was first attested as the arpa de dos órdenes ("two-row harp") in Spain and Portugal, in the 17th century. The inline chromatic harp is generally a single-course harp with all 12 notes of the chromatic scale appearing in a single row. Single course inline chromatic harps have been produced at least since 1902, when Karl Weigel of Hanover patented a model of inline chromatic harp. Amplified (electro-acoustic) hollow body and solid body electric lever harps are produced by many harpmakers, including Lyon & Healy, Salvi, and Camac. They generally use individual piezo-electric sensors for each string, often in combination with small internal microphones to produce a mixed electrical signal. Hollow body instruments can also be played acoustically, while solid body instruments must be amplified. The late-20th century gravikord is a modern purpose-built electric double harp made of stainless steel based on the traditional West African kora. The modern English word harp comes from the Old English hearpe; akin to Old High German harpha. A number of non-harp-like instruments are colloquially referred to as "harps". Chordophones like the aeolian harp (wind harp) and the autoharp (with the piano and harpsichord) are not harps, but zithers, because their strings are not perpendicular to their soundboard. Similarly, the many varieties of harp guitar and harp lute, while chordophones, belong to the lute family and are not true harps. All forms of the lyre and kithara are also not harps, but belong to the fourth family of ancient instruments under the chordophones, the lyres. The term "harp" has also been applied to many instruments which are not chordophones. The vibraphone was (and is still) sometimes referred to as the "vibraharp", though it has no strings and its sound is produced by striking metal bars. In blues music, the harmonica is often casually referred to as a "blues harp" or "harp", but it is a free reed wind instrument, not a stringed instrument, and is therefore not a true harp. The Jew's harp is neither Jewish nor a harp; it is a plucked idiophone and likewise not a stringed instrument. The laser harp is not a stringed instrument at all, but is a harp-shaped synthesized electronic instrument that has laser beams where harps have strings. The harp has been used as a political symbol of Ireland for centuries. Its origin is unknown but from the evidence of the ancient oral and written literature, it has been present in one form or another since at least the 6th century or before. According to tradition, Brian Boru, High King of Ireland (died at the Battle of Clontarf, 1014) played the harp, as did many of the gentry in the country during the period of the Gaelic Lordship of Ireland (ended c. 1607 with the "Flight of the Earls" following the Elizabethan Wars). In traditional Gaelic society every clan and chief of any consequence would have a resident harp player who would compose eulogies and elegies (later known as "planxties") in honour of the leader and chief men of the clan. The harp was adopted as a symbol of the Kingdom of Ireland on the coinage from 1542, and in the Royal Standard of King James VI and I in 1603 and continued to feature on all English and United Kingdom Royal Standards ever since, though the styles of the harps depicted differed in some respects. It was also used on the Commonwealth Jack of Oliver Cromwell, issued in 1649 and on the Protectorate Jack issued in 1658 as well as on the Lord Protector's Standard issued on the succession of Richard Cromwell in 1658. The harp is also traditionally used on the flag of Leinster. 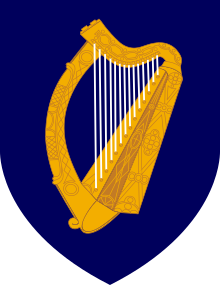 Since 1922, the government of Ireland has used a similar left-facing harp, based on the Trinity College Harp in the Library of Trinity College Dublin as its state symbol. It first appeared on the Great Seal of the Irish Free State, which in turn was replaced by the coat of arms, the Irish Presidential Standard and the Presidential Seal in the 1937 Constitution of Ireland. The harp emblem is used on official state seals and documents including the Irish passport and has appeared on Irish coinage from the Middle Ages to the current Irish imprints of euro coins. Guinness since 1759, Harp Lager since 1960, Irish Independent since 1961 originally in black but in green since 1972 and Ryanair since 1985. The South Asian Tamil harp yaal is the symbol of City of Jaffna, Sri Lanka, whose legendary root originates from a harp player. In the context of Christianity, heaven is sometimes symbolically depicted as populated by angels playing harps, giving the instrument associations of the sacred and heavenly. In the Bible, Genesis 4:21 says that Jubal, the first musician and son of Lamech, was 'the father of all who play' the harp and flute. Many depictions of King David in Jewish art have him holding or playing a harp, such as a sculpture outside King David's tomb in Jerusalem. The harp is also used extensively as a corporate logo, by private companies and government organisations. 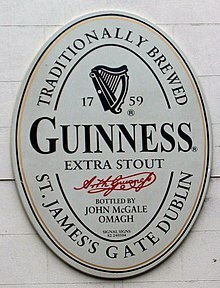 The Irish beer Guinness uses a harp, facing right and less detailed than the version used on the state arms. Relatively new organisations also use the harp, but often modified to reflect a theme relevant to their organisation: Irish airline Ryanair uses a modified harp, and the Irish State Examinations Commission uses it with an educational theme. The harp appears in the logo for League of Ireland football team Finn Harps F.C., Donegal's senior soccer club. 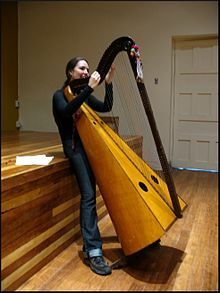 Other organisations in Ireland use the harp, but not always prominently; these include the National University of Ireland and the associated University College Dublin, and the Gaelic Athletic Association. In Northern Ireland the Police Service of Northern Ireland and Queen's University of Belfast use the harp as part of their identity. In Iraq, the football club Al-Shorta is nicknamed Al-Qeetharah (Assyrian Neo-Aramaic: "the harp"‎), and has a harp on its logo. ^ "The Sumerian Harp of Ur, c. 3500 B.C.E." Oxford Journal of Music and Letters. X (2):: 108–123. 1929. ^ "Lyres: The Royal Tombs of Ur". SumerianShakespeare.com. ^ "History of the Harp | International Harp Museum". internationalharpmuseum.org. Retrieved 18 June 2016. ^ Neville Agnew (3 August 2010). Conservation of Ancient Sites on the Silk Road: Proceedings of the Second International Conference on the Conservation of Grotto Sites, Mogao Grottoes, Dunhuang, People's Republic of China, June 28 – July 3, 2004. Getty Publications. pp. 118–. ISBN 978-1-60606-013-1. ^ Ehsan Yar-Shater (2003). Encyclopædia Iranica. Routledge & Kegan Paul. pp. 7–8. ISBN 978-0-933273-81-8. ^ Vipulananda (1941). "The Harps of Ancient Tamil-Land and The Twenty-Two Srutis of Indian Musical Theory". Calcutta Review. LXXXI (3). ^ Kamil Zvelebil (1992). Companion Studies to the History of Tamil Literature. BRILL. pp. 145–. ISBN 90-04-09365-6. ^ The Journal of the Numismatic Society of India. Numismatic Society of India. 2006. pp. 73–75. ^ "Konghou". Encyclopaedia Britannica. Retrieved 2 October 2018. ^ Hu-myŏng Yun; Kyungnyun K. Richards; Steffen F. Richards (2005). The love of Dunhuang. Cross-Cultural Communications. ISBN 978-0-89304-737-5. ^ a b Montagu, Jeremy (2002). "Harp". In Alison Latham. The Oxford Companion to Music. London: Oxford University Press. p. 564. ISBN 0-19-866212-2. OCLC 59376677. ^ a b The Anglo Saxon Harp, 'Spectrum, Vol. 71, No. 2 (April 1996), pp. 290–320. ^ a b The Anglo-Saxon Harp Robert Boenig Speculum, Vol. 71, No. 2 (April 1996), pp. 290–320 doi:10.2307/2865415 This article consists of 31-page(s). ^ David Nicholls (19 December 2013). Whole World of Music: A Henry Cowell Symposium. Routledge. pp. 161&nbsp, ff. ISBN 978-1-134-41946-3. ^ Folk Harp Journal. 99. 1999. ^ Marcela Méndez (1 January 2004). Historia del arpa en la Argentina. Editorial de Entre Rios. ISBN 978-950-686-137-7. ^ John Mendell Schechter (1992). The Indispensable Harp: Historical Development, Modern Roles, Configurations, and Performance Practices in Ecuador and Latin America. Kent State University Press. p. 36. ISBN 978-0-87338-439-1. ^ Ortiz, Alfredo Rolando. "History of Latin American Harps". HarpSpectrum.org. Retrieved 12 December 2014. ^ George Torres (27 March 2013). Encyclopedia of Latin American Popular Music. ABC-CLIO. p. 14. ISBN 978-0-313-08794-3. ^ John Mendell Schechter (1992). The Indispensable Harp: Historical Development, Modern Roles, Configurations, and Performance Practices in Ecuador and Latin America. Kent State University Press. p. 201. ISBN 978-0-87338-439-1. ^ Fernando F. Guerrero Briceño (1999). El arpa en Venezuela. FUNDARTE, Alcaldía de Caracas. ^ Eric S. Charry (1 October 2000). Mande Music: Traditional and Modern Music of the Maninka and Mandinka of Western Africa. University of Chicago Press. pp. 76–. ISBN 978-0-226-10162-0. ^ Donna A. Buchanan (1 October 2007). Balkan Popular Culture and the Ottoman Ecumene: Music, Image, and Regional Political Discourse. Scarecrow Press. pp. 239–. ISBN 978-0-8108-6677-5. ^ a b John Shepherd; David Horn; Dave Laing; Paul Oliver; Peter Wicke (8 May 2003). Continuum Encyclopedia of Popular Music of the World Part 1 Performance and Production. A&C Black. pp. 435–. ISBN 978-1-84714-472-0. ^ Alvad, Thomas (October 1954). "233. The Kafir Harp". Man. Royal Anthropological Institute of Great Britain and Ireland. 54: 151–154. doi:10.2307/2795578. ^ Neville Agnew (3 August 2010). Conservation of Ancient Sites on the Silk Road: Proceedings of the Second International Conference on the Conservation of Grotto Sites, Mogao Grottoes, Dunhuang, People's Republic of China, June 28 – July 3, 2004. Getty Publications. pp. 121–. ISBN 978-1-60606-013-1. ^ John Stanley (1 May 1997). Classical Music: An Introduction to Classical Music Through the Great Composers & Their Masterworks. Reader's Digest Association. p. 24. ISBN 978-0-89577-947-2. ^ DeVale, Sue Carole. "Grove Music Online". Oxford University Press. ^ Norman Del Mar (1983). Anatomy of the Orchestra. University of California Press. pp. 435–. ISBN 978-0-520-05062-4. ^ Bouchaud, Dominig. "Is "Celtic" a myth? The Lever Harp in Brittany". Harp Blog. ^ John T. Koch. Celtic culture: a historical encyclopedia. Vol. 1-. ABC-CLIO. pp. 893–. ISBN 978-1-85109-440-0. ^ Patricia O. Mikishka (1989). Single, double, and triple harps, 1581–1782: harps having two or three rows of parallel strings. Part II. Department of music, Stanford University. p. 48. ^ International Musical Society (1903). Zeitschrift. Breitkopf und Härtel. p. 196. ^ L. E. Blaze; Louis Edmund Blaze (1921). The Story of Lanka: Outlines of the History of Ceylon from the Earliest Times to the Coming of the Portuguese. Asian Educational Services. p. 45. ISBN 978-81-206-1074-3. ^ "On the Relative Difficulties of Depicting Heaven and Hell in Music by Carl Van Vechten". The Musical quarterly. 1919. pp. 553–. ^ Chris Woodstra; Gerald Brennan; Allen Schrott (2005). All Music Guide to Classical Music: The Definitive Guide to Classical Music. Backbeat Books. pp. 699–. ISBN 978-0-87930-865-0. Thomas Gaisford (1848). Etymologicum magnum. ISBN 960-400-139-6. Lucia Bova (2008). L'arpa moderna. La scrittura, la notazione, lo strumento e il repertorio dal '500 alla contemporaneità. Sugarmusic. ISBN 978-88-900691-4-7. John Shepherd; David Horn; Dave Laing; Paul Oliver; Peter Wicke (8 May 2003). Continuum Encyclopedia of Popular Music of the World Part 1 Performance and Production. A&C Black. pp. 427–437. ISBN 978-1-84714-472-0. Ruth K. Inglefield; Lou Anne Neill (1985). Writing for the Pedal Harp: A Standardized Manual for Composers and Harpists. University of California Press. ISBN 978-0-520-04832-4. Lucile Lawrence; Carlos Salzedo (1929). Method for the Harp; Fundamental Exercises with Illustrations and Technical Explanations (as an Introduction and Complement to Carlos Salzedos̀ "Modern Study of the Harp") by Lucile Lawrence and Carlos Salzedo. 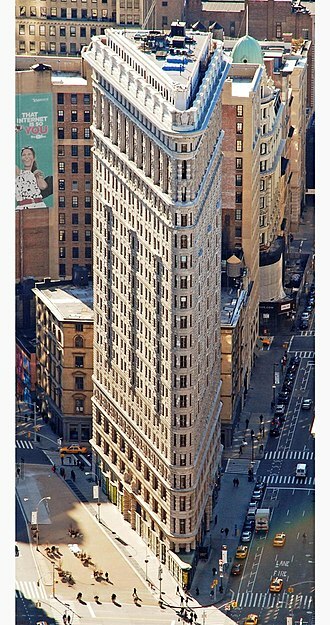 New York, G. Schirmer. Roslyn Rensch (June 2007) [original edition 1989]. Harps and harpists. Indiana University Press. ISBN 0-253-34903-6. Wikimedia Commons has media related to Harps. Wikisource has the text of the 1911 Encyclopædia Britannica article Harp. The saung is an arched harp used in traditional Burmese music. The saung is regarded as a musical instrument of Burma. The saung is unique in that it is a very ancient harp tradition and is said to be the only surviving harp in Asia. The Burmese harp is classified as an arched horizontal harp since the body is more horizontal as opposed to the Western harp. The main parts of the harp are the body, the curved neck, carved out of the root of a tree. The top of the body is covered with a tightly stretched deer hide. The standard dimensions of the saung are 80×16×16 centimetres, the neck terminates in a highly decorated representation of the bo tree leaf. The whole of the body is decorated with pieces of mica, gilt. The ends of the strings on the harp is decorated with red cotton tassels, the saungs strings are made of silk or nylon. The thirteen to sixteen strings of the harp angle upwards from the bar to the string bindings on the lower part of the curved arch of the neck. Traditionally, tuning was accomplished by twisting and adjusting the string bindings, recently constructed harps have machine heads or tuning pegs to make tuning easier. The pedal harp is a large and technically modern harp, designed primarily for classical music and played either solo, as part of a chamber ensemble, or in an orchestra. The pedal harp is a descendant of ancient harps. It typically has a range of six and a half octaves, weighs about 36 kilograms, is about 1.85 metres high, has a depth of 1 metre, and is 55 centimetres wide at the bass end of the soundboard. The notes range from three octaves below middle C♭ to three and a half octaves above, usually ending on G♯, using octave designations, the range is C♭1 to G♯7. At least one manufacturer gives the harp a 48th string, a high A♭ giving the instrument a range of C♭1 to A♯7, the two lowest strings, C♭1 and D♭1, are not affected by the pedal mechanism. Their pitch must be adjusted in advance for the whole piece and it cant be changed while playing. A pedal harp typically has six and a half octaves, weighs about 36 kg, is about 1.8 m high, has a depth of 1.2 m, and is 55 cm wide at the bass end of the soundboard. The notes range from three octaves below middle C to three and a half octaves above, usually ending on G, the tension of the strings on the soundboard is roughly equal to a ton. The lowest strings are made of copper or steel-wound nylon, the strings of gut. The D, E, G, A, B strings are colored white while the C strings are colored red. The strings are tuned to all flat pitches, that is. The concert harp is a pedal harp, pedals were first used in 1697. Pedal harps use the action of pedals to change the pitches of the strings. There are seven pedals, each affecting the tuning of all strings of one pitch-class, the pedals, in order from left to right, are D, C, B and E, F, G, A. 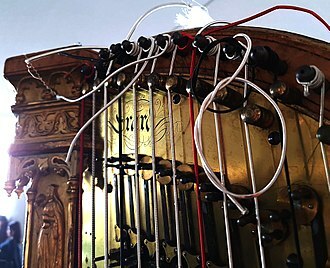 Each pedal is attached to a rod or cable within the column of the harp, when a pedal is moved with the foot, small discs at the top of the harp rotate. The discs are studded with two pegs that pinch the string as they turn, shortening the length of the string. In the top position no pegs are in contact with the string and all notes are flat, thus the harps native tuning is to the scale of C♭ major. The Celtic harp is a triangular harp traditional to Brittany, Ireland and Wales. It is known as a telenn in Breton, cláirseach in Irish, clàrsach in Scottish Gaelic, in Ireland and Scotland, it was a wire-strung instrument requiring great skill and long practice to play, and was associated with the Gaelic ruling class. It appears on the coins and coat of arms of the Republic of Ireland, the early history of the triangular frame harp in Europe is contested. The first instrument associated with the tradition in the Gaelic world was known as a cruit. This word may originally have described a different stringed instrument, being related to the Welsh crwth. It has been suggested that the word clàrsach/cláirseach was coined for the triangular frame harp which replaced the cruit, the last two are examples of the small low-headed harp, and are both made from hornbeam, a wood not native to Scotland. All three are dated approximately to the 15th century and may have made in Argyll in western Scotland. Many “Irish” harps from periods have no provenance and could possibly be of Scottish origin, gerald refers to the cythara and the tympanum, but their identification with the harp is uncertain, and it is not known that he ever visited Scotland. In construction the Irish and Scottish harps may in general be considered as one, a characteristic feature is the metal strings. Historical sources mention various types of wire, including brass and iron, some argue for the use of silver. The wires were attached to a massive soundbox typically carved from a log, commonly of willow, although other woods including alder. This harp had a reinforced curved pillar and a substantial neck, the strings, usually played with the fingernails, produced a brilliant ringing sound. This type of harp is unique amongst single row triangular harps in that the first two strings tuned in the middle of the gamut were set to the same pitch. In Scottish Gaelic, the names of the components of the clàrsach were as follows, cnagan, com r forepillar), cruidhean nan teud, the corr had a brass strap nailed to each side, pierced by tapered brass tuning pins. The Spring and Autumn period was a period in Chinese history from approximately 771 to 476 BC which corresponds roughly to the first half of the Eastern Zhou dynasty. The periods name derives from the Spring and Autumn Annals, a chronicle of the state of Lu between 722 and 479 BC, which associates with Confucius. The gradual Partition of Jin, one of the most powerful states, marked the end of the Spring and Autumn period, in 771 BC, the Quanrong invasion destroyed the Western Zhou and its capital Haojing, forcing the Zhou king to flee to the eastern capital Luoyi. The event ushered in the Eastern Zhou dynasty, which is divided into the Spring and Autumn, during the Spring and Autumn period, Chinas feudal system of fengjian became largely irrelevant. The Zhou court, having lost its homeland in the Guanzhong region, held nominal power, during the early part of the Zhou dynasty period, royal relatives and generals had been given control over fiefdoms in an effort to maintain Zhou authority over vast territory. As the power of the Zhou kings waned, these became increasingly independent states. The most important states came together in regular conferences where they decided important matters, during these conferences one vassal ruler was sometimes declared hegemon. As the era continued and more powerful states annexed or claimed suzerainty over smaller ones, by the 6th century BC most small states had disappeared and just a few large and powerful principalities dominated China. Some southern states, such as Chu and Wu, claimed independence from the Zhou, in Chengzhou, Prince Yijiu was crowned by his supporters as King Ping. The Zhou court would never regain its authority, instead. Though the king de jure retained the Mandate of Heaven, the title held little actual power, a total of 148 states are mentioned in the chronicles for this period,128 of which were absorbed by the four largest states by the end of the period. The kings prestige legitimized the military leaders of the states, over the next two centuries, the four most powerful states—Qin, Jin, Qi and Chu—struggled for power. Samudragupta was the fourth ruler of the Gupta Empire and the son and successor of Chandragupta I. Much of the knowledge of Samudraguptas military exploits comes from the Allahabad Pillar of Ashoka which includes a prashasti extolling the deeds, Samudragupta was the son of Chandragupta I and the Lichchhavi princess, Kumaradevi. He is believed to have been his fathers chosen successor even though he had several elder brothers, some believe that after the death of Chandragupta I, there was a struggle for succession in which Samudragupta prevailed. It is said that Samudragupta became the ruler after subduing his rival, Samudragupta is depicted on his coins both as a muscular warrior flaunting the marks of hundreds of wounds received in battle as well as a poet and a musician. His reign marked the beginning of what is referred to as the golden age of Indian history. Chandragupta I, a Magadha king, was the ruler of the Gupta Dynasty and married a Lichhavi princess. This enabled him to gain a hold over the Ganges river-basin and he ruled from his capital at Pataliputra for about ten years in north-central India with his son, Samudragupta, as an apprentice. After his death, Samudragupta assumed the throne and did not rest until he had conquered almost the whole of India and his reigning period may be described as a vast military campaign. To begin with, he attacked the kingdoms of Ahichchhatra. He conquered the whole of Bengal, some kingdoms in Nepal and he absorbed some tribal states like the Malvas, the Yaudheyas, the Arjunayanas, the Abhiras and the Maduras. The rulers of what is now Afghanistan and Kashmir were added to the empire, the main source of Samudraguptas history is an inscription engraved on the Allahabad pillar. In this inscription is detailed Samudraguptas conquests, the inscription to Samudraguptas martial exploits states that its author is Harisena, who was an important poet of Samudraguptas court. Eran Inscription of Samudragupta presently stored in Kolkata National Museum, the beginning of Samudraguptas reign was marked by the defeat of his immediate neighbours, ruler of Ahichchhatra, and Nagasena. Following this Samudragupta began a campaign against the kingdoms to the south and this southern campaign took him south along the Bay of Bengal. A triangle is a polygon with three edges and three vertices. It is one of the shapes in geometry. A triangle with vertices A, B, and C is denoted △ A B C, in Euclidean geometry any three points, when non-collinear, determine a unique triangle and a unique plane. This article is about triangles in Euclidean geometry except where otherwise noted, triangles can be classified according to the lengths of their sides, An equilateral triangle has all sides the same length. An equilateral triangle is a polygon with all angles measuring 60°. An isosceles triangle has two sides of equal length, some mathematicians define an isosceles triangle to have exactly two equal sides, whereas others define an isosceles triangle as one with at least two equal sides. The latter definition would make all equilateral triangles isosceles triangles, the 45–45–90 right triangle, which appears in the tetrakis square tiling, is isosceles. A scalene triangle has all its sides of different lengths, equivalently, it has all angles of different measure. Hatch marks, called tick marks, are used in diagrams of triangles, a side can be marked with a pattern of ticks, short line segments in the form of tally marks, two sides have equal lengths if they are both marked with the same pattern. In a triangle, the pattern is no more than 3 ticks. Similarly, patterns of 1,2, or 3 concentric arcs inside the angles are used to indicate equal angles, triangles can be classified according to their internal angles, measured here in degrees. A right triangle has one of its interior angles measuring 90°, the side opposite to the right angle is the hypotenuse, the longest side of the triangle. The other two sides are called the legs or catheti of the triangle, special right triangles are right triangles with additional properties that make calculations involving them easier. 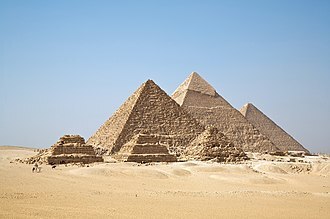 One of the two most famous is the 3–4–5 right triangle, where 32 +42 =52, in this situation,3,4, and 5 are a Pythagorean triple. The other one is a triangle that has 2 angles that each measure 45 degrees. The Ming dynasty was the ruling dynasty of China – known as the Empire of the Great Ming – for 276 years following the collapse of the Mongol-led Yuan dynasty. The Ming, described by some as one of the greatest eras of orderly government, although the primary capital of Beijing fell in 1644 to a rebellion led by Li Zicheng, regimes loyal to the Ming throne – collectively called the Southern Ming – survived until 1683. He rewarded his supporters and employed them as a counterweight against the Confucian scholar-bureaucrats. One, Zheng He, led seven enormous voyages of exploration into the Indian Ocean as far as Arabia, the rise of new emperors and new factions diminished such extravagances, the capture of the Zhengtong Emperor during the 1449 Tumu Crisis ended them completely. The imperial navy was allowed to fall into disrepair while forced labor constructed the Liaodong palisade, haijin laws intended to protect the coasts from Japanese pirates instead turned many into smugglers and pirates themselves. The growth of Portuguese and Dutch trade created new demand for Chinese products and produced an influx of Japanese. This abundance of specie remonetized the Ming economy, whose money had suffered repeated hyperinflation and was no longer trusted. While traditional Confucians opposed such a prominent role for commerce and the newly rich it created, combined with crop failure and epidemic, the dynasty collapsed before the rebel leader Li Zicheng, who was defeated by the Manchu-led Eight Banner armies who founded the Qing dynasty. The Mongol-led Yuan dynasty ruled before the establishment of the Ming dynasty, consequently and the economy were in shambles, and rebellion broke out among the hundreds of thousands of peasants called upon to work on repairing the dykes of the Yellow River. A number of Han Chinese groups revolted, including the Red Turbans in 1351, the Red Turbans were affiliated with the White Lotus, a Buddhist secret society. Zhu Yuanzhang was a peasant and Buddhist monk who joined the Red Turbans in 1352. A string is the vibrating element that produces sound in string instruments such as the guitar, harp and members of the violin family. Strings are lengths of a material that a musical instrument holds under tension so that they can vibrate freely. Wound strings have a core of one material, with an overwinding of other materials and this is to make the string vibrate at the desired pitch, while maintaining a low profile and sufficient flexibility for playability. This enabled stringed instruments to be made with less thick bass strings, on string instruments that the player plucks or bows directly, this enabled instrument makers to use thinner strings for the lowest-pitched strings, which made the lower-pitch strings easier to play. The end of the string that mounts to the tuning mechanism is usually plain. Depending on the instrument, the other, fixed end may have either a plain, loop. When a ball or loop is used with a guitar, this ensures that the string stays fixed in the bridge of the guitar, when a ball or loop is used with a violin-family instrument, this keeps the string end fixed in the tailpiece. Fender Bullet strings have a cylinder for more stable tuning on guitars equipped with synchronized tremolo systems. Strings for some instruments may be wrapped with silk at the ends to protect the string, the color and pattern of the silk often identifies attributes of the string, such as manufacturer, intended pitch, etc. There are several varieties of wound strings available, the simplest wound strings are roundwound—with round wire wrapped in a tight spiral around either a round or hexagonal core. Such strings are usually simple to manufacture and the least expensive and they have several drawbacks, Roundwound strings have a bumpy surface profile that produce friction on the players fingertips. This causes squeaking sounds when the fingers slide over the strings. Roundwound strings higher friction surface profile may hasten fingerboard and fret wear, when the core is round, the winding is less secure and may rotate freely around the core, especially if the winding is damaged after use. Flatwound strings have either a round or hex core, the winding wire has a rounded square cross-section that has a shallower profile when tightly wound. A sound board, or soundboard, is the surface of a string instrument that the strings vibrate against, usually via some sort of bridge. Pianos, guitars and many other stringed instruments incorporate soundboards, the resonant properties of the sound board and the interior of the instrument greatly increase the loudness of the vibrating strings. The sound board operates by the principle of forced vibration, the string gently vibrates the board, and despite their differences in size and composition, makes the board vibrate at exactly the same frequency. This produces the sound as the string alone, differing only in timbre. 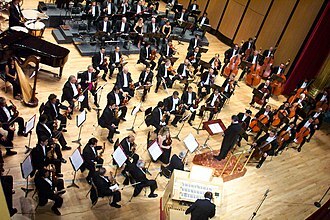 The string would produce the amount of energy without the board present, but the greater surface area of the sound board moves a greater volume of air. Sound boards are made of wood, though other materials are used. Wooden sound boards typically have one or more sound holes of various shapes, oval, or F-holes appear on many plucked instruments, such as guitars and mandolins. F-holes are usual in violin family instruments, the upper surface of the sound board, depending on the instrument, is called a top plate, sound-table, or belly. Living along the valleys of the Tigris and Euphrates, Sumerian farmers were able to grow an abundance of grain and other crops, the surplus of which enabled them to settle in one place. Proto-writing in the dates back to c.3000 BC. 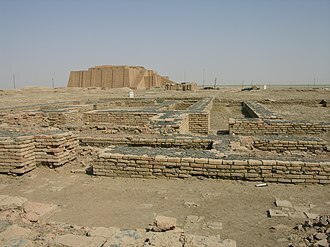 The earliest texts come from the cities of Uruk and Jemdet Nasr and date back to 3300 BC, modern historians have suggested that Sumer was first permanently settled between c.5500 and 4000 BC by a West Asian people who spoke the Sumerian language, an agglutinative language isolate. These conjectured, prehistoric people are now called proto-Euphrateans or Ubaidians, some scholars contest the idea of a Proto-Euphratean language or one substrate language. 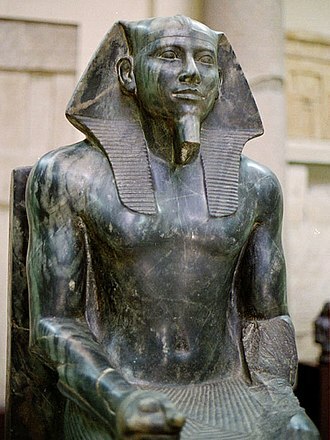 Reliable historical records begin much later, there are none in Sumer of any kind that have dated before Enmebaragesi. 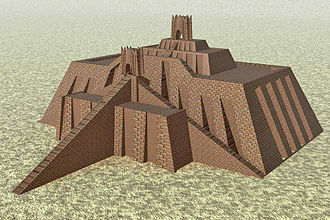 Juris Zarins believes the Sumerians lived along the coast of Eastern Arabia, todays Persian Gulf region, Sumerian civilization took form in the Uruk period, continuing into the Jemdet Nasr and Early Dynastic periods. 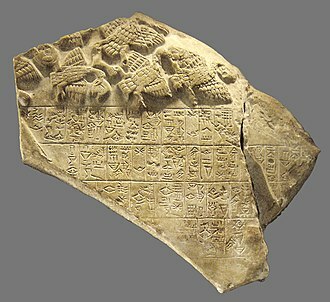 During the 3rd millennium BC, a cultural symbiosis developed between the Sumerians, who spoke a language isolate, and Akkadian-speakers, which included widespread bilingualism. The influence of Sumerian on Akkadian is evident in all areas, from lexical borrowing on a scale, to syntactic, morphological. 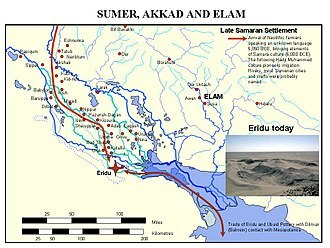 This has prompted scholars to refer to Sumerian and Akkadian in the 3rd millennium BC as a Sprachbund, Sumer was conquered by the Semitic-speaking kings of the Akkadian Empire around 2270 BC, but Sumerian continued as a sacred language. Native Sumerian rule re-emerged for about a century in the Neo-Sumerian Empire or Third Dynasty of Ur approximately 2100-2000 BC, the term Sumerian is the common name given to the ancient non-Semitic-speaking inhabitants of Mesopotamia, Sumer, by the East Semitic-speaking Akkadians. The Sumerians referred to themselves as ùĝ saĝ gíg ga, phonetically /uŋ saŋ gi ga/, literally meaning the black-headed people, the Akkadian word Shumer may represent the geographical name in dialect, but the phonological development leading to the Akkadian term šumerû is uncertain. Typical chord (or fretless) 'guitar zither,' (model made in East Germany). Samudragupta inscriptions on Allahabad pillar. Curtain grommets, used among others in shower curtains. Metal eyelets and an eyelet setting tool. The Nigg Stone, 790–799 AD, Class II, shows a Pictish harp, beasts and warriors in a 19th-century illustration, minus the top section. 1805 Irish penny depicting an Irish harp, long used as a national symbol. The Dupplin Cross in St Serf's Church, Dunning. Woman playing konghou, details of a painting by Qiu Ying, Ming Dynasty. Two female musicians play the saung at a performance in Mandalay. Three string instruments (17th century). Harpist Elaine Christy plays with both hands approaching the strings from either side of the harp. The harp is a chordophone with prominent strings. Jazz bass walking bass lines are traditionally played with pizzicato. Jazz pizzicato technique, shown above, is different from traditional pizzicato technique.